The quality of Federal-Mogul Precision Super Strength U-joints (universal joints), axle joint, can be seen in all aspects of Precision Super Strength U-joints, from Precision's forged and case-hardened alloy steel crosses to Precision U joints high-quality, heat-treated needle bearings. The value of Precision Super Strength U-joints, axle joints can be found in Precision's extensive offering of premium super-strength U-joints for passenger vehicles. All Precision super-strength U-joints, axle joint are machined to meet or exceed original equipment specifications. All parts are precision-ground to stringent tolerances with quality-control inspections at every step of the manufacturing process. This Combination u-joint Axle to yoke Spicer 1310 to a GM small Spicer 1310 (GM Chevette) used in racing aplications, smaller axle for tubbing out a ride, but still needing the larger drive shaft, with two inside snap ring cups with a OD of 1.063", and two outside snap ring cups with a OD of 1.063". 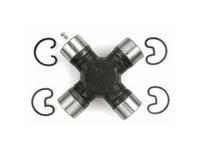 All Precision super-strength U-joints are machined to meet or exceed original equipment specifications. All Precision super-strength U-joints parts are precision-ground to stringent tolerances with quality-control inspections at every step of the manufacturing process. 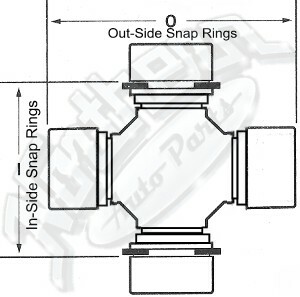 This u-joint fits Fords cars & trucks with two inside snap ring cups with a OD of 1.063", and two outside snap ring cups with a OD of 1.125".